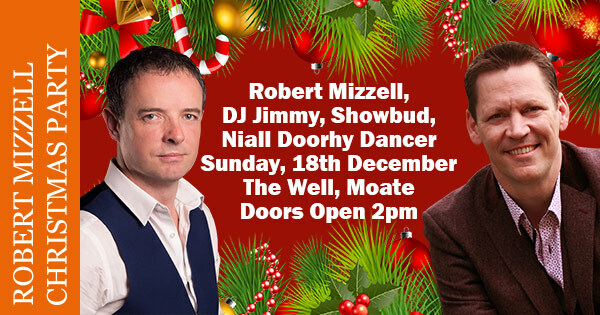 Get your Dancing Shoes ready because this Sunday, the 18th of December, the Well in Moate is the place to be. Here I will be holding my annual Christmas Party for all Dance Pupils, Friends and Country Music Lovers. Why not kick start your Holiday Season with a bit of Country Music afternoon dancing to the great Robert Mizzell and the Country Kings? The easiest way to avoid a late night going into an early Monday morning for work is to go dancing in the afternoon! Last September we had Robert Mizzell for our Social Night at The Well in Moate and it was a fantastic night. Not a single person remained in their seats throughout the whole night such was the level of entertainment and the firepower of the Dancers who attended. I’m really looking forward to this event and you can expect this year’s afternoon of Song and Dance to be even better than the last time because of the Festive Season approaching. Doors will be opening at 2pm followed by Social Dance music until 3:30pm. Everyone is welcome so bring your Family and Friends. Robert and his Band kick off at 3:30pm for 2 hours of non-stop dancing. For those wanting more dancing we have DJ Jimmy taking charge after Robert Mizzell. Later that evening more Live Band music will take place when Showbud take to the stage at 9:30pm. The winner will be announced on Friday 16th of December at 6:00pm. Best of luck to you all!